In professional business settings, marketers typically show customers being made happy by their products. They do this because it’s an incredibly effective way to sell things. If you’re a consumer who sees someone very much like you (or a person you’d like to be) being made happy by a particular product, you are likely to want that product. This isn’t just a truism; it’s a time-tested formula that’s backed by decades of theory, research, testing and practical application. If you’re a marketer who wants to sell something in a competitive marketplace, show your customers being made happy by your product and they’ll beat a path to your door. In the amateur world of arts marketing, meanwhile, marketers never show customers being made happy by their products. Instead, arts marketers focus exclusively on the superior attributes of their events, artists and organizations while presupposing an audience of avid consumers. Focusing on consumers isn’t part of our arts marketing traditions – most of which were formed at a time when the arts were popular aspirational luxury products. Emphasizing customer satisfaction back then was a non-issue because, if customers were eager to buy our products, and they already knew our products would make them happy, we didn’t need to focus on them. Today of course the arts are increasingly marginalized niche products struggling to survive in a competitive marketplace. The demand for theatre, opera, dance, classical music and fine art is diminishing steadily, and potential new customers – if they bother to consider traditional art forms at all – don’t necessarily assume these products will make them happy. The arts aren’t popular anymore, few consumers consider them aspirational, and the only reason we’d call them luxury products is the prohibitive price of admission. If you’re a marketer who’s trying to sell unpopular products and you want to persuade indifferent consumers to become first-time buyers, you might want to start showing customers how your products will make them happy, which will mean showing people like them being made happy by your products. If you’re not quite sure how to do do this, start by cutting 50% of the photos you plan to use in your next marketing campaign and replacing them with pictures of consumers enjoying one another’s company at your venue. Let’s say, for example, that you’re an orchestra marketer preparing to design your next season brochure and you’ve selected twenty shots of your conductor (yes, orchestra marketers actually do this). Cut ten of them and replace them with pictures of people who look like the people you’d like to see buying tickets. Show them arriving eagerly together, enjoying pre-show dining, running into friends, gazing in anticipation as the lights dim, chatting over drinks at intermission, etc. Make it as much about your customers’ experience with your product as it is about your product. And make sure to make it about their experience with one another, because sharing the experience is why they’re there. NOTE: Those photos of actual audiences that you shot from the side aisles don’t count. If you can afford professional photo shoots of your artists, you can afford professional photo shoots of model audiences, too. New audiences don’t buy art; they buy worthwhile experiences they can share with other people. If you want to attract new audiences who don’t know why they should come, show them pictures of people like them having a good time together in your venue. Or, you could just keep publishing absurdly insular, painfully stereotypical, impersonal, stuffy and embarrassingly self-congratulatory images that are all about you and that have nothing whatsoever to do with the experiences your new audiences are likely to have with your art form. Making marketing more about our customers is cheap and easy, and it sells more tickets. Greg Sandow wrote an interesting post last week where he said that arts administrators might be more effective marketers if they learned how to better communicate their passion for their products. He proposed “visioning” workshops designed to help artists and administrators explore and describe their passions so they can be more articulate in sharing them with outsiders – a process that he says might allow a new brand to emerge from the deepest vision of why the orchestra exists. I admire Greg’s writing, and he and I are often on the same page, but not here. We’re not even in the same book on this one, and I think we might be in different libraries. Even if classical music industry professionals became incredibly good at describing their passion for what they do, it wouldn’t matter. It’s not persuasive. Nobody cares what a bunch of classical music insiders feel about their products. Nobody buys tickets to an orchestral concert for the first time because the insiders who produced it say they’re just crazy in love with what they do. Classical music marketers’ feelings are all well and good, but if orchestras are too busy indulging in their own passions to learn what their customers are passionate about, they’re going to appear hopelessly self-absorbed and out of touch – and they’re going to continue losing audiences. Customers, believe it or not, are moved by the things they’re passionate about. If you want them to buy tickets, you have to focus on their yearnings and communicate how happy they are going to be when they buy your products because it’s all about them. It’s not about you. It’s about them. I know. I know. It used to be about you and you used to be able to talk endlessly about how wonderful and important you are, but that was a long time ago. The world has changed. You don’t matter anywhere near as much as you once did, so it can’t be just about you anymore. It has to be about them. Did I mention that it’s about them? Greg Sandow was almost on to something here, but he missed the mark when he said, “even people from the audience,” as if the audience were an afterthought. Communicating passion for the product is an excellent idea and testimonial marketing can be a powerfully persuasive tool for motivating ticket buyers, but the message can’t come from the inside, it has to come from the outside. It has to come from a credible third party. It has to come from a source that potential customers trust and can easily identify with, which means that it has to come from someone who’s part of their world. Ideally, someone very much like them. Let’s say your organization has decided to appeal to younger audiences and your research suggests that they’re motivated by social status, quality live music and spending leisure time in special places with people they care about. You could ask a young cellist to record a testimonial describing how she loves creating music, or you could ask a young audience member who loves coming to the symphony with friends to record a testimonial describing what a wonderful time she’s been having there. I know what Greg was getting at: Nonprofit arts organizations produce inane, meaningless marketing content because they haven’t taken time to honestly examine – and learn how to express – their deep-seated passion for what they’re selling. But I disagree with his premise. Non-profit arts organizations produce inane, meaningless marketing content because they haven’t learned what their audiences care about so they don’t know what to say to ignite their passions. We’re all passionate about what we do and our passion plays an indispensable role in providing high-quality arts experiences. But when it comes to selling these experiences, the thing that matters most is our customers’ passion for what we’re trying to sell. I set out to find some truly dreadful arts marketing copy for this post, so I picked a respected LORT theatre at random, went to their website and clicked on a show. How does this happen? Who approved this for publication? Who the hell would want to go to this show? And who was the focus group respondent who said, “I’m just aching to see a portrait of an unraveling mind amid a society engulfing and destroying its very best.” This would be absolutely horrifying if it weren’t typical of the way arts organizations have been talking about their products for the last forty years. Wait a minute… It is horrifying. Theatre audiences are disappearing. How can professional theatre companies afford to do such incompetent marketing? But this copy fails painfully on all counts. At best it suggests an unsettling experience watching nasty people do disturbing things to one another. I’ve been researching ticket buyers’ desires for decades and have yet to come across pent up demand for this sort of thing. The fact that a respected professional theatre would endeavor to sustain itself by speaking to customers this way is an embarrassment to the entire industry. One can only hope that the quality of work on the stage is better than the quality of work coming out of their executive offices. If you write copy for your arts organization and you’d like to avoid producing this sort of mindless drivel, here is a simple, no-cost formula that will put you on a more professional track. Get a young person from outside your organization to join you in some role playing. Have them ask you the following questions and audio-record your answers so you can transcribe them later. What’s the next show at your venue? Why would someone like me be interested in seeing a show like this? Sounds like a big commitment; what do I get in return for my investment of time and money? Now here’s the important part: Take the material you isolated and edit it into a potent little nugget of fresh, engaging sales copy. Don’t change it. Don’t make it sound like a regional theatre blurb. Don’t formalize it or, god forbid, “punch it up.” Just ‘speak’ to your customers plainly and honestly as if they’re thinking, feeling human beings who you know would enjoy a night out in your venue watching a really good show. And one more thing. Get someone who wasn’t sleeping through 7th grade English to check the grammar. People who run performing arts institutions have no right to complain about diminishing audiences when they publish idiotic nonsense like this in their marketing materials. Professional theatre should be marketed by professionals. If the regional theatre industry and its support systems (i.e. foundations and major donors) think this is an acceptable way for the arts to talk to tomorrow’s audiences, they’re just engulfing and destroying their very best. Once, while interviewing for a marketing post at a major American opera company, I was asked If I’d brought a portfolio of my previous marketing materials. I hadn’t, of course. I was a marketing professional interviewing for a senior marketing job. I had provided a resume, which outlined a successful track record in strategic sales, revenue generation and audience growth, but it never occurred to me to bring printed collateral and I found myself searching for a diplomatic way to explain why marketing execs don’t bring design portfolios to job interviews. I understand why nonprofit arts leaders might have wanted to see some lovely printed materials. 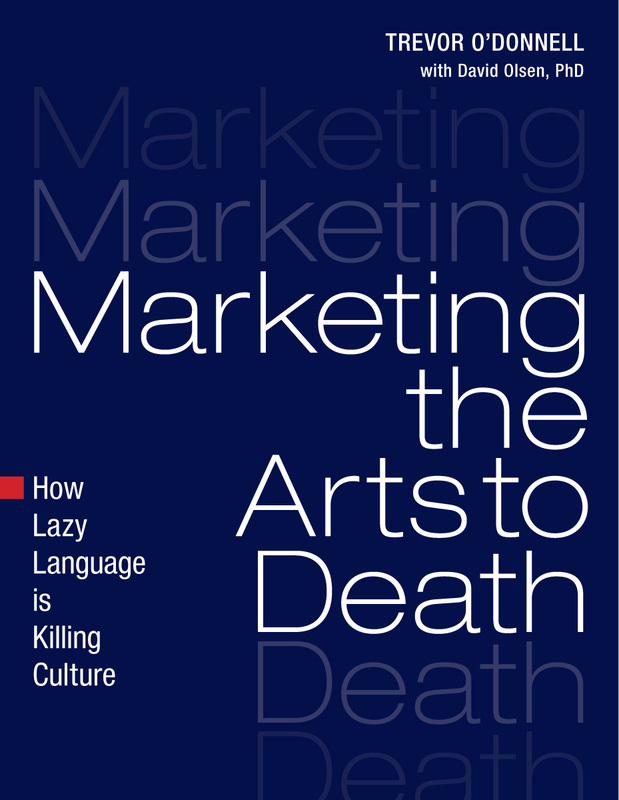 This is, after all, what many arts leaders think marketing is about. But in an era when audiences are in steady decline and institutions like this are likely to fail, it’s tragic to think that such amateurism persists at such high industry levels. Marketing is about numbers. Any arts leader worth his salt knows this. I wrote a few weeks ago about a job ad for a marketing director at a Dallas theatre that focused like a laser beam on strategy, sales and revenue. It looked like a good job working in a professional environment for smart people. But yesterday I saw an ad for a marketing director at a South Carolina orchestra that focused primarily on the production of promotional materials. It looked like a perfect job for a nonprofit functionary working for old school leaders who like to send out a lot of pretty brochures. In my career I’ve encountered two fundamentally different approaches to arts marketing, the administrative, which focuses on sustaining customary marketing operations, and the proactive, which focuses on selling tickets. The administrative concerns itself with running marketing departments, while the proactive concerns itself with doing what needs to be done to earn revenue. The two approaches can be compatible under certain circumstances, but given the arts industry’s internal focus and over-dependence on tradition (not to mention the lack of professional marketing expertise among arts leaders), the administrative tends to overwhelm the proactive. How about you? Are you selling enough tickets to ensure a robust future for your art form? Is your marketing function a deft, nimble, customer-centered, proactive sales initiative that isn’t held back by tradition, habit or leadership priorities that favor the status quo? Or are you doing a really good job of running a nonprofit arts organization’s marketing department? When I asked what distinguished the community she was referring to from the one I was referring to, my colleague described a community made up of people from senior centers, urban schools, ethnic minorities and other marginal groups, all of whom occupied social positions well below hers or those of her colleagues in the cultural sector. In her nonprofit worldview, ‘community’ meant lesser people whose lives might be improved by art, and the intended recipients of her charity bore little resemblance to the folks who had traditionally sustained her arts organization. I’ve had this conversation often enough to know that when the arts talk about community, we’re usually talking about a subset of the population from which traditional buyers and donors are conspicuously absent. Our core sustaining audiences are affluent, educated, culturally aware consumers who work in businesses and professions and who align themselves with social circles and affinity groups that are consistent with their status. But these are rarely the people or the groups we think about when we set out to engage. ‘Community’ in the arts means people at the lower end of the social ladder and engagement is a benevolent gesture offered to raise them up. There’s nothing wrong with the charitable mentality that encourages nonprofits to make art available to marginal communities, but applying this thinking to engagement in hopes of building dependable future audiences is counterproductive and fiscally irresponsible. Engagement for charity is a zero sum game. If we keep losing audiences while investing precious resources in populations that lack the potential to replace our customary support systems, we’ll die. This may be a hard pill to swallow for some, but if your organization expects its community engagement efforts to grow sustaining audiences, those efforts must be directed toward the community members who are most likely to buy tickets. Engagers who want to influence audience development have a fundamental responsibility to identify and isolate their most promising sub-communities, in advance, and focus their engagement efforts where they’ll deliver the strongest ROI. Marketers do this every day. Marketers have limited resources that must be used in the most responsible way, so they concentrate on the most likely ticket buyers. Engagers, who have even fewer resources, can’t afford to squander them on relationships that offer no useful return. It may sound callous, but arts organizations can’t afford to function as charities when their audiences are shrinking and their own survival is in question. Of course any arts organization can do engagement for engagement’s sake, but this has to be paid for by funders and it can’t be counted as audience development. Or, arts organizations can engage productively with potential ticket buyers, create mutually beneficial community relationships AND deliver a reasonable return on their investment. Some may believe that it’s possible to do both, but anyone who tries it will need a precise set of metrics to determine exactly what the programs cost, how much they’re projected to return and who’s going to cover the losses. Trust me. If you launch engagement programs for charitable reasons and expect them to generate revenue, there will be losses. So what’s the alternative? Try something like this: If you’re an arts administrator whose job description includes engagement, plan and propose a relationship-building program for your local legal community. Organize an event with a thematic tie-in for an upcoming show. Invite a prominent guest host who’s well known in legal circles and solicit the help of a handful of influential judges to lend their names to the invitation. Get key board members involved and encourage them to invite legal professionals in their social circles. Make it a fun, interactive program designed to better connect your organization’s staff and artists to a promising new audience of affluent, educated community members. And design the event’s messaging to promote long-term participatory relationships between your guests and your organization with an emphasis on ease-of-access to quality ticket inventory. Here’s the ultimate question: Are these lawyers any less deserving of engagement than the rest of the community? I have a lawyer friend who’s smart, curious and culturally literate, but a regular Joe for the most part. He doesn’t go to the theatre or attend classical concerts or dance events very often, but there’s no reason he wouldn’t find them rewarding if he did. And there’s every reason to expect that he would if, through his professional circles, he discovered a personal connection to some of the rich cultural offerings in his city. Why on earth wouldn’t we engage with people like him? Linking community engagement to audience development is a dangerous business. If engagement is about growing audiences, nonprofit engagers have an unmistakable fiscal duty to use resources in the most prudent manner possible, which means there must be a measurable, predictable financial benefit to the organization. Otherwise, nonprofit arts organizations become pass-through charities with well-intentioned but finite futures.